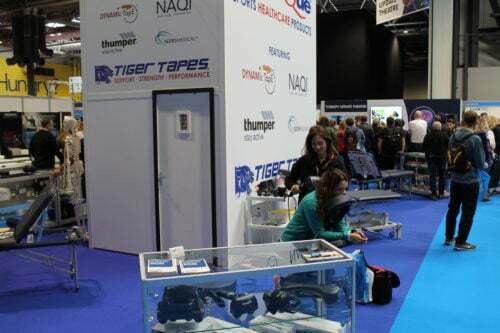 Thumper at Physique Management’s pavilion in Therapy Expo – Birmingham, UK. November 2018. Thumper representatives Zohrab Toutounjian and Jenny Lee at CMCC Practice OpportUnity, Toronto, February 2018. 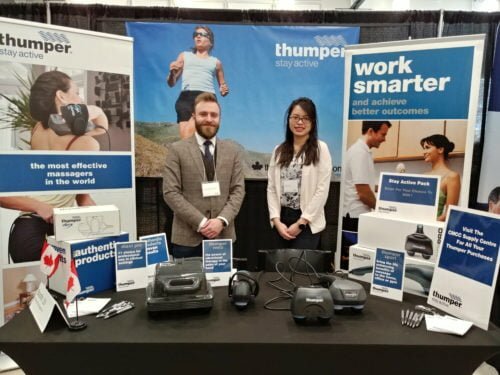 Thumper recently participated at the Canadian Memorial Chiropractic College’s Practice Event. 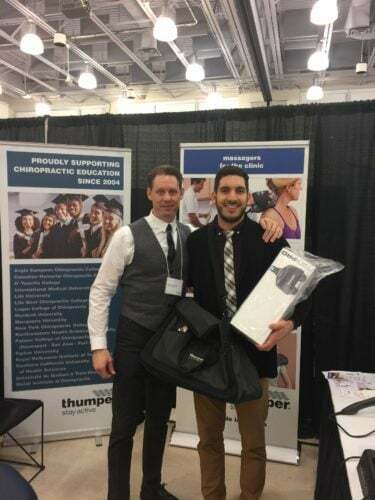 Amir Hasan pictured here with Sales & Marketing Manager Ryan Darbyson won the Stay Active Pack in the CMCC Draw that day. It was very exciting. Congratulations Amir. Chiropractic interns use the Thumper VMTX in the Sports Medicine Clinic on the Southern California University of Health Sciences campus. June 2016. 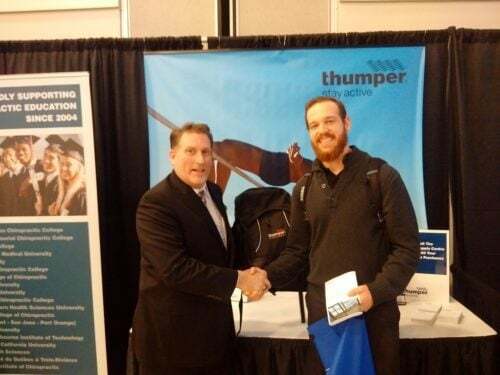 Congratulations to Jamie Alexandre, 2016 CMCC graduate, winner of a Thumper Stay Active Pack. February 17 in Toronto, Canada. Thumper representative demonstrating the New Mini Pro. Medtrade Atlanta October 2015. Medica Show in Dusseldorf, Germany, November 2014. Medtrade Show, Atlanta, Georgia, USA, October 2014. 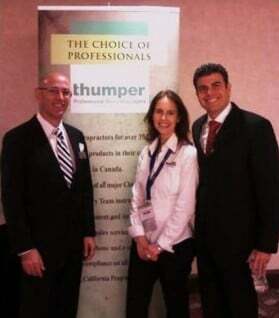 General Manager Paul Sajgalik with Thumper Representatives Shaunt Mahdessian, Michael Watters and Derek Bowden at OCA Show, Toronto, Ontario, Canada, October 2013. Dr. Laney Nelson, DC, Clinical Director, Biofreeze® High Performance Clinic, Logan Chiropractic College with Thumper representatives at ProSport Conference, Las Vegas, Nevada, December 2012. Intern using a Thumper Massager on a patient at the BIOFREEZE® Sports & Rehabilitation Center, Logan College of Chiropractic, Chesterfield, Missouri, USA, January 2012. 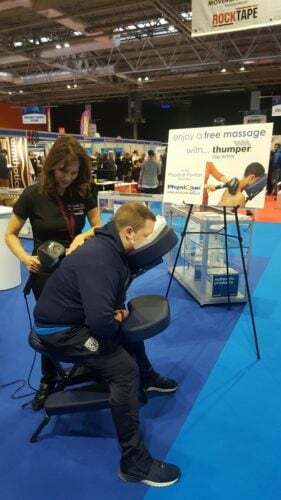 Thumper Massagers being demonstrated at Chiropractic Essentials 2011 – United Chiropractic Association, Birmingham, UK, October 2011. 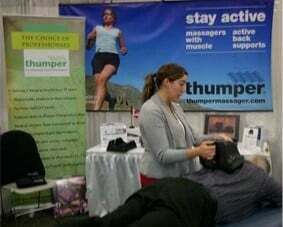 Kinesiologist Melissa Zabaneh demonstrating the Thumper Massager at the AMTA (American Massage Therapy Association) National Convention in Portland, Oregon, USA, October 2011. 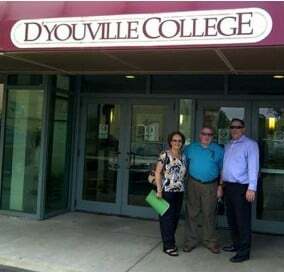 Thumper Massager Inc. visits D’Youville College: Dr. Stephen Zajac, Chiropractic Dept. Clinical Associate Professor, Coordinator of Clinical Services Chiropractic Program, Buffalo, New York, July 2011. Rio de Janeiro, Brazil, April 2011. Manolis Karamanlakis International Greek Body Builder Champion, Getting “thumped” at the Athens Sport Show, Greece, 2010. Saudi MOH Representative visiting the Thumper Booth at Arab Health, Dubai, United Arab Emirates, 2010. 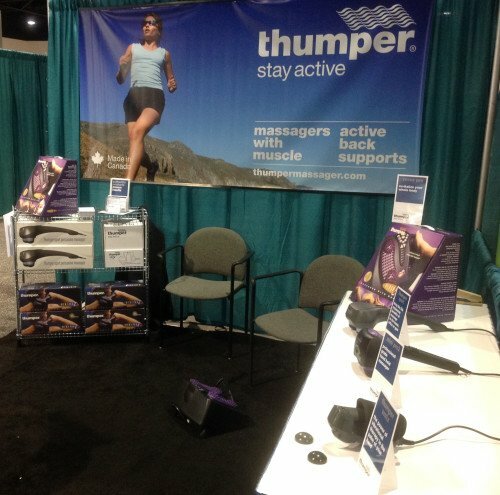 Thumper representative at The National, the world’s largest event for the chiropractic profession. Florida, August 2018. 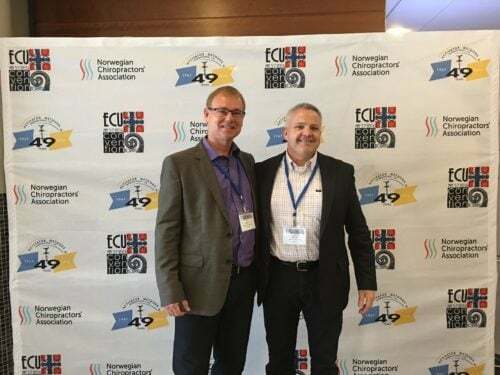 General Manager Paul Sajgalik with Thumper’s Norwegian distributor Darren Stainsby at the ECU 2016 in Oslo, Norway. 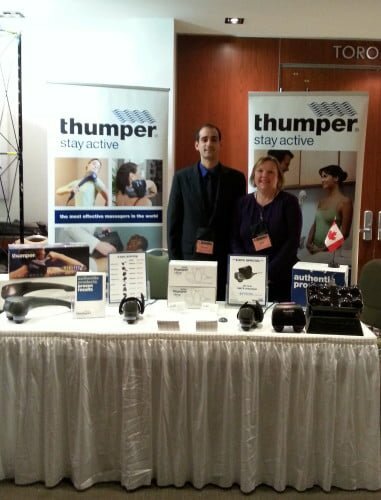 Thumper Representative exhibiting at the ECU Convention in Athens, Greece. May 2015. 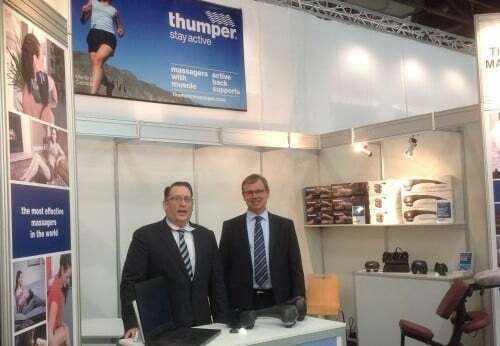 Erno Luksic from MacAnder Kft., exhibits Thumpers at a local Hungarian Trade Show. 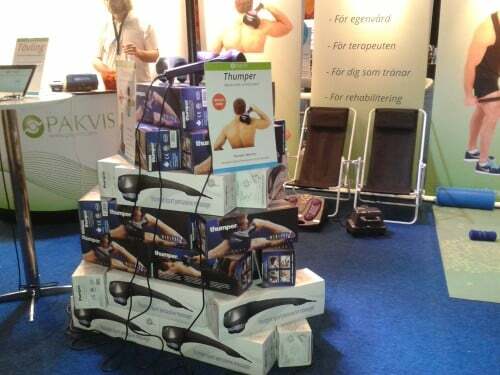 Pakvis Health at Fitnessgalan in Stockholm, Sweden, May 2014. Dr. John Zigler, DC and Dr. Jean Moss, DC, MBA, with Inés Sajgalik, President of Thumper Massager Inc. at European Chiropractors’ Union Convention, Barcelona, Spain, May 2013. Liz Roberts from the Better Back Shop demonstrating the Maxi Pro at Back Pain Show, Hammersmith and Fulham, London, UK, February 2012. Dr. John Scaringe, President, Southern California University of Health Sciences, Inés Sajgalik, President of Thumper Massager Inc., SCU Centennial Extravaganza, Anaheim, California, USA, 2011. 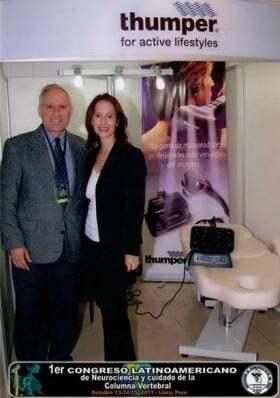 Dr. Felipe Castro-Mendivil, D.C., President of the Peruvian Chiropractors Association, with Ines Sajgalik, President of Thumper Massager Inc. at 1st Latin American Congress of Neuroscience and Vertebral Column Care, Lima, Peru, October 2011. 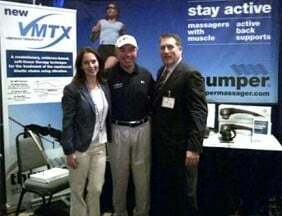 Michael Watters, Business Development Office-Thumper Massager Inc. with Kathryn Hadley, Media Coordinator-Institutional Advancement and Peter Van Tyle, Esq. 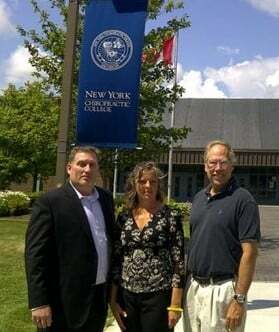 Vice President Institutional Advancement in House Counsel, New York Chiropractic College, Seneca Falls, New York, USA, July 2011. 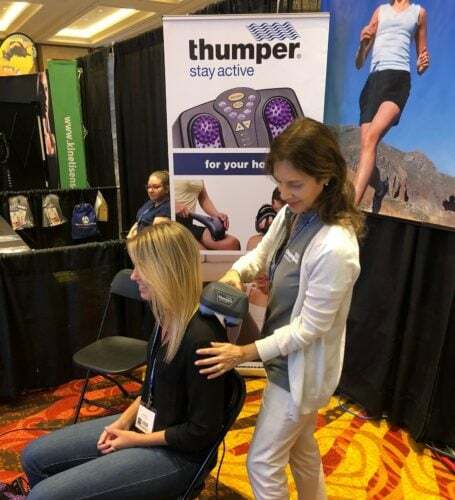 Thumper Massager Inc. visits New York Chiropractic College: Dr.Wendy Maneri D.C., M.S. 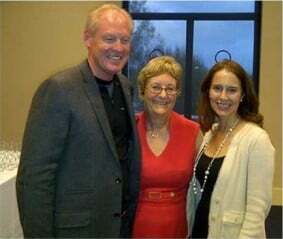 Chief of Staff Seneca Health Systems with Thumper representatives, Seneca Falls, New York, USA, July 2011. 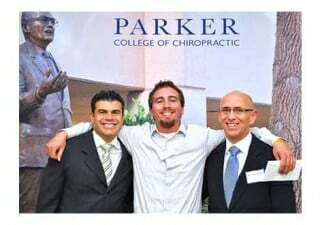 Spring Scholarship Luncheon “Thumper Student Scholarship” awarded to Robert Ioven (C) with Dr. Fabrizio Mancini, DC (L) and Dr. Gilles LaMarche, DC (R), President and Vice-President of Parker College of Chiropractic, 23 March 2011. Thumper participation at FIBELLA Trade Show, Lima, Peru, November 2010. Dr. Fabrizio Mancini, DC President, Parker College of Chiropractic, Getting “thumped” before his presentation at the Canadian Chiropractic Convention, Toronto, Ontario, Canada, 2010.